So I am on Day 16 of my Sugar Detox! Things have been going really well! I am really happy with how I am feeling and have been surprised by my lack of chocolate cravings! It is definitely something I plan to continue to some degree in the future when the 21 days are up! Since being on this detox I have really had to re-think my meals and get a little creative with how to sweeten foods. I have been really wanting granola lately, but almost all store bought granola’s are made with some form of added sugar and most homemade ones are made with maple, agave, or honey (which I am not having during this detox). I have been loving dates and bananas to sweeten my oats etc. So I decided why not use banana to make my granola? And guess what? It was a success! 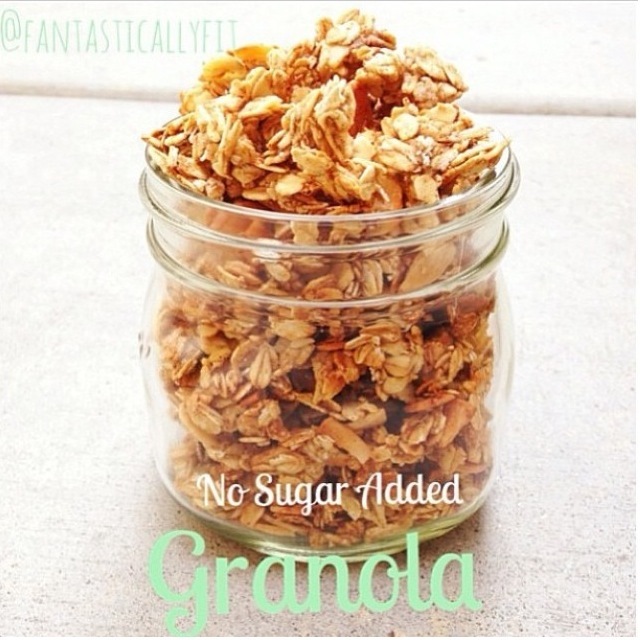 Not only is this granola AMAZING! But, it also made the whole house smell heavenly! Whats even better? The recipe is super simple! And I may or may not have eaten the entire portion last night…..
Make sure the banana is mixed in really well with the nuts and oats. I added a ton of cinnamon and apple pie spice. Add as much as you want to taste. Place the mixture on a cookie sheet covered with parchment paper. Make sure to spread the mixture so that it is all one layer. Bake at 325F for approximately 30 minutes. Half way through take the cookie sheet out and mix the granola and put it back in the oven for the remaining 15 minutes. Keep an eye on it to make sure the granola does not burn. You can easily add dried fruit or chia seeds to this mixture. I added dried fruit in the morning when I had it for breakfast. 28 Responses to "No Sugar Added Granola"
I’m making your granola right now and I cannot even describe how amazing it smells. I changed it up a little, I used a cup of oats, about half a tablespoon of cinnamon, a small banana, and then I grounded to a powder a quarter of a bar of dark cacao chocolate. Literally smells amazing. I’m really enjoying a lot of your ideas and recipes. Thanks! This sounds really good and simple too. Have you tried it with unsweetened applesauce or pureed fresh apple instead of banana? I have only done it with banana. But, unsweetened apple sauce or pureed apple would work just as well. Let me know how it goes! What a great idea! I have been searching for a way to have granola without using refined sweeteners. I have a batch of your recipe in the oven right now and can’t wait to taste it. Have you been able to find dried fruit that isn’t made with sugar? Awesome! Let me know if you make it! Yes, I only buy dried fruit with no added sugar. I get it from Trader Joes, Sprouts, and Whole Foods. I store it in a mason jar at room temperature and it lasts for 2 weeks! What if I don’t have parchment paper? is there something else I can use? Maybe tinfoil sprayed with non stick spray so it doesn’t stick. hello. how much of the mashed apples should you use if you subsitute it for banana? Hi! I’ve never made it with mashed apples, but maybe 1/2 a cup. Or enough so that it mixes with all of the oats. I hope that helps! what is the difference between using old fashioned oats and steel cut oats? I mainly eat steel cut oats so i have alot of that in my pantry…will that work as well or no? There is a difference between old fashioned oats and steel cut oats. You could try making it with them, but it might be chewier and hard to eat. Let me know if you try it! How many calories do u think are in 1/2 cup? I don’t count calories so I am not sure. Sorry! A beautiful recipe I am so excited to try! Awesome! I hope you loved it as much as I do! I tried your recipe. But mine is a bit sticky with mushed banana. I putted some seeds as well and them seem to be sticked with the oat. But yours is very beautiful. Or i can’t put seed together in the oven and better just add after baked? Sorry to hear it was sticky. I recommend making sure the banana is mixed well. Also bake at a lower temperature for a longer time. I’ve been looking for a way to cut sugar out and this is a great and simple recipe. My problem is I’m allergic to both bananas and almonds. The almonds are easy to substitute but I was wondering if you had suggestions for replacing the banana..
You could try unsweetened Apple sauce that should work as well! Unfortunately, I don’t know how much since I haven’t tried it. You may just have to play around. Good luck! !